What do you do when you are the only one in your home who is fasting? You have become Orthodox and your spouse has not, or you live with people who simply do not fast. What are some strategies for you to keep the fast? Rita offers some suggestions. Greetings, everyone, and welcome to another session of Food, Faith, and Fasting. Today what I thought we could do is address a question that I have been receiving quite frequently from listeners to this podcast. It’s a perfect question to kind of fit into the fasting season that is upon us. Yes, once again we’re entering another fasting season. It’s just so wonderful to me to see how we have this rhythm, this cycle, that the Church calendar just creates for us. I don’t know about you, but I’m ready for another fast, so I’m excited to be entering the fasting period of the Nativity. What I thought we could do is specifically address the question: If you are living in a home where you might be the only person fasting—I’ve received this from a lot of different people. They might be living in a home with other Orthodox Christians, but the other Orthodox Christians just don’t fast, and this person is trying to keep the fast. Another bigger one, though, that I’ve been seeing is people that have become Orthodox and the rest of their family has not become Orthodox yet or is of a different tradition, so they’re living in a home where they want to keep the fast but it’s not really something that other people in the household are keeping. So what do you do in that situation? Well, first and foremost I thought it would be helpful to start off with a teaching by St. Basil the Great in terms of the blessing of fasting and the benefit it is for us. As bodily food fattens the body, so fasting strengthens the soul, imparting it an easy flight. It makes it able to ascend on high, to contemplate lofty things, and to put the heavenly higher than the pleasant and pleasurable things of life. 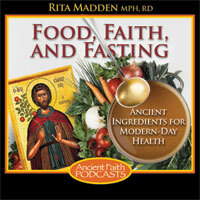 We see through this teaching again just the wonderful benefits of fasting. If you are about to embark on a fast and no one else in your household is doing it, it is beneficial for you to still do this. This is again a discipline; it’s a spiritual tool that allows us to work on attaining theosis or this constant communication with the divine. It’s a tool for our benefit. First and foremost, if you’re living in this sort of household where you’re fasting and no one else is, I encourage you to seek the guidance of your spiritual father. More than anyone you’ve probably had discussions with them about your home life and so on and so forth, and they might have specific suggestions for how you can keep the fast during the Nativity with the home life that you’re living in. I’ll give some practical suggestions right now, but then I want to move into maybe some other concepts in terms of how we can help our other family members understand what this fasting is all about. Obviously, for some practical, basic things, if you’re fasting and others in your family have an understanding of what the fasting is all about and they’re just not going to be fasting with you, a practical thing to do is think about how the meals can be cooked and be modified. For example, you can maybe make a vegetable soup, and then if people want to add some cheese or some beef to their vegetable soup, that can be put in later on. Same thing with a pasta dish. You can make a pasta dish with sauteéd vegetables, and maybe some people want some grilled chicken on there. That can be added at the end. Same thing with a sandwich. You can make a vegetable sandwich while other people are maybe eating grilled cheese sandwiches. Think about how the practical aspects of cooking need to take place to essentially set yourself up for success. Remember: I really think that another part of the discipline is not just necessarily the foods, but the preparation that goes into them. So just those couple of extra things that you need to think about is an important thing. Kind of think about how this is part of this whole discipline. Another thing to keep in mind is that if you do not usually help out in the kitchen, but it’s a fasting season, you might want to make an extra effort to help out. You don’t want the person who is cooking for you to feel like this is some huge burden. If you’re there helping out, that burden is taken away. That’s just another thing to think about. We’re lending our hands in the kitchen to make this fasting happen for us. Again, the preparation for the fast, thinking about what you’re going to eat, the extra planning that has to go into it—this can all be part of the discipline. It’s much easier to throw it all out the window, so there is something that we’re doing to make this happen. We want to do it, but, again, God doesn’t need us to fast. God doesn’t need us to do anything. It’s a choice that we’re making. We want to participate in this discipline because we know it’s a spiritual tool for our benefit, for our growth in the faith, in Christ. When you’re also talking to your family members, just some practical approaches to them are to say, “You know, I know I’m fasting for specific reasons, but why don’t you try it with me solely for the health benefits of it, just completely based on the healthy aspect of eating this way for a period of time?” You know what? They might just all be on board. “Okay, I’ll try it. I’ve heard a lot about the benefits of a vegan diet. Why not let me give it a try?” So that is an approach that you might want to take with family members. Another thing that you can always mention—this is something that my husband and I are impressed about when we fast—is how it is on the family and house budget. Some of the most expensive foods are the things that we’re avoiding during the fasting season, so you can encourage the family: “Hey, look, this is a great way for us to save some money for the holiday season. Let’s fast!” Maybe another fun thing that you might want to throw out there. Giving them an understanding of this approach to fasting will open their experience to it. It might not be such a burden for them to change up the menu. Just something to think about. If they don’t know anything about it, then it’s easy for people to shut the door and not understand why you’re doing it and not want to understand why you’re doing it, but if they see that it’s something important to you, then they might want to embrace it more and support you more in it. An excellent faster is he who restrains himself from every impurity, who imposes abstinence on his tongue and restrains it from idle talk, foul language, slander, condemnation, flattery, and all manner of evil speaking, who abstains from anger, rage, malice, and vengeance, and withdraws from every evil. I read this teaching and I thought about the homes where one is fasting and the other is not, and I thought, “Wow! What a great challenge for the faster! If they can be practicing the teachings of St. Ephraim the Syrian on such a level that this fasting period becomes such an example to all those around…” When people see that you’re having a change of heart as a result of something that you’re doing, a change of actions in something that you’re doing, they want to know where that’s coming from. Remember that not only are you changing the way you’re eating during this period of time, but you’re involved more in prayer, you’re trying to be even more cautious about becoming slow to anger and idle talk, all these things that are [easy] traps that we fall into in our daily lives. That’s something to reflect on, and that might be a quote that you’d want to share with your spouse that is not Orthodox or is not fasting. Give them this example that, yes, while I’m working on the food end of it, I’m also trying to work on all this, and that’s only going to hopefully benefit our marriage and our family life. If you fast regularly, do not be inflated with pride. If you think highly of yourself because of it, then you had better eat meat. It is better for a man to eat meat than to be inflated with pride and glorify himself. So we see this wonderful teaching from this Desert Father and we recognize how much it can start to creep up in our own lives when we enter a fasting season. I don’t ever think it’s too much to re-remind ourselves of these teachings when we enter a fasting season. Also remind your family, tell your family, “This is not a legalistic approach.” I think this is something that a lot of people who are not accustomed to the Eastern Orthodox approach to fasting might think that people are very legalistic, and if we’re fasting in that sort of way, we’re really giving fasting a really bad rap. So just be aware: when we’re fasting and others are not, all eyes are on us. We are the example of how this discipline, this tool is benefiting our spiritual life, our walk in Christ. Be aware of that. You are the example. Recognize that there are many different ways to accomplish this goal. Think about your own personal situation, and, like I said, talk to your spiritual father for guidance. From that point, see what you can do on a practical level in your own home with the foods that are being served. Make it an easy process for the person that is in charge of cooking by lending a helping hand. Go as far as to share some recipes with them, and share some different strategies that could work. Like I said, “Make some soup for the whole family, and if you don’t mind, just leave this out on my end,” and so on and so forth. Simplify it for them. Don’t just give some broad terms: “Oh, I’m eating vegan.” They might have never even heard of that term and might not even know where to start. Make it simple for the person that is in charge of the cooking process. One easy way to do that is to be involved in the cooking and the shopping process and the menu planning process as much as possible. Again, maybe encourage your family to participate in this fast solely based on health reasons. Mention how it could be good for the house budget. And then finally, take the time to teach your family members—or whoever you’re eating with that is not fasting—about what this fasting approach is all about. One other thing to keep in mind is that, of course when we fast we don’t want to go around broadcasting it or anything like that, so as much as possible, just be aware of that, and remind yourself of the teaching of the Desert Father that I just mentioned, that we want to be cautious about not becoming inflated with pride when we are fasting. As we enter the Nativity Fast, I wish you a blessed fasting season and one that is supported with gaining the spiritual benefits of what the fast is all about. Bye!